Healthy dogs and cats can help less fortunate animals by becoming blood donors for our program. To get on our potential donor screening list, call 609.259.8300, email us or take our online interactive survey. Many pet parents aren't aware that, just as in human medicine, blood products can be a life-saving resource for critically ill or injured pets. Time is of the utmost importance when blood and plasma products are required, and can often be difficult to find. 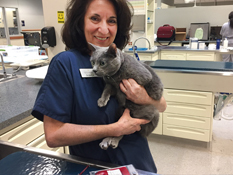 Fortunately, NorthStar VETS offers an in-house blood bank service with inventory at the ready. 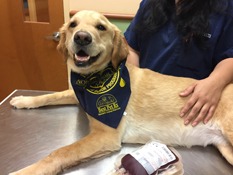 Blood products are donated through a local, all-volunteer, canine and feline donor network - pets just like yours. The donation process is easy and fast and includes lots of affection and treats. Dogs must weigh more than 50 lbs. We will perform a complimentary preliminary examination and evaluation of your pet to make sure they are physically and psychologically qualified to be a blood donor. Once your pet passes this exam, you must commit to the donor program for at least one year, at four donations per year. Pets can safely donate blood as often as every 7 weeks. The blood collection process is almost completely painless, and takes only 10-20 minutes. You are free to wait for your pet in our lobby, stay with them, or drop them off. While donating, your pet will enjoy lots of attention from NorthStar VETS' dedicated staff, and immediately afterwards, fluids will be given as well as lots of treats - the pet equivalent of juice and cookies!